The Rocket parked in a dressing room chair for several minutes without attempting to remove his equipment. He just sat there shaking his head and mumbling to himself. Pictured above, a scene from the fourth game in Toronto. 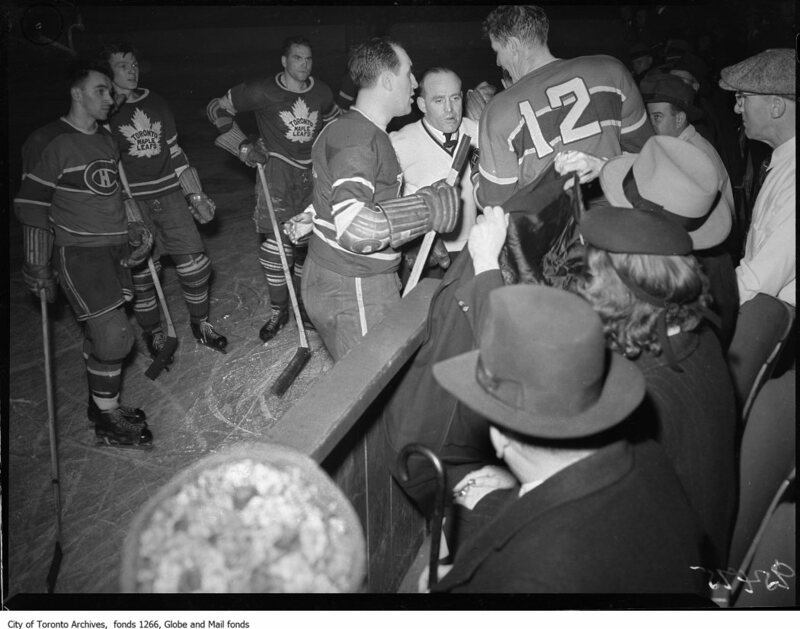 Gus Bodnar won it for the Leafs in overtime when a shot of Babe Pratt’s deflected off his his stick and passed by Bill Durnan. Toronto’s Sweeney Schriner — the foxy veteran, Dink Carroll from Montreal’s Gazette called him — scored, too, and while that’s him with elbow pads showing, the goal came earlier. Here, in the third period, he’s arguing with Montreal’s Murph Chamberlain, numbered 12, a.k.a. Old Hardrock. Jim Coleman from The Globe and Mail noted that he was floored twice in the first period, first by the Leafs’ Jack McLean, then by Schriner. Referee King Clancy called no penalties at the time, but in the third (as told by Toronto’s Daily Star), Schriner threw the first punch of his career at Chamberlain. “They scragged it then,” the Star said, “were broken up.” Both players were excused with minor penalties. “You oughta give Schriner a major for fighting,” roared Chamberlain. Notice the front-row fan in the light-hued hat holding up his coat for protection or (possibly) playing at toreadoring. The Globe did report that in this very ruckus a woman ducked a stray punch.